Journey of a Tibetan: Scots NO for Independence: What it Means for China and Tibet? Scots NO for Independence: What it Means for China and Tibet? Keeping aside the democratic system of the United Kingdom and communist regime of China, Scots big NO for independence may be a good indication that not everyone in this world prefers to be independent. The definition of independence has evolved through centuries and centuries of industrialization, growth and development. Now, people (including Scots) seem to tie this definition of independence to the economic viability and stability of the country in general and public in particular. Staying with the United Kingdom continues to provide economic, structural and security benefits for Scotland. However, new and independent Scotland may end up as a weak country with no or less resources at its disposal. Also, she may have to start from the scratch which could impact the very livelihood of its citizen. Scots voted with brain - rather than heart - by opting to stay with the United Kingdom. Looking at the present world, the decision seems wise and pragmatic. 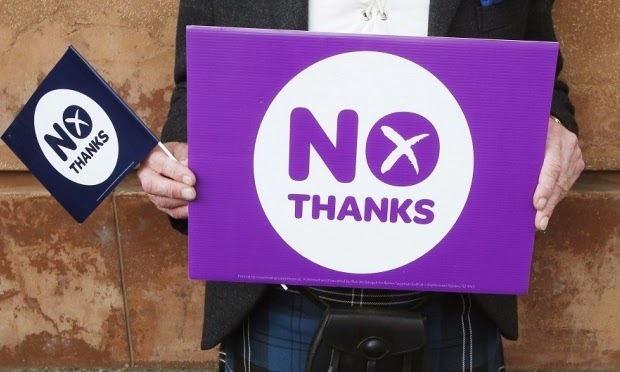 Though this NO vote by Scots is a huge relief for China - who sees its possible rolling effect on Taiwan, Hong Kong, Tibet, and Xinjiang if Scots voted YES for independence - it however does succeed in providing a strong and clear message that people prefers freedom over independence. Keeping this in mind, China may have to rethink it's policy of repression and exclusion for its minorities. Putting money into minority areas does not suffice the heart and soul of people who lives there. The real growth and harmony will not come only from the economic development. It has to be the combination of economic prosperity and individual freedom. When this happens, China should not be wary of any referendum for independence. In the case of Tibet, Scots NO for independence may have given some assurance to the United Front Work Department of CPC Central Committee that the Middle Way Approach of the Central Tibetan Administration based in Dharamsala, India has no hidden agenda for independence. When people cherish the freedom and see the benefit of staying in One Big Union, its proven now that they do not see the benefits of separation.